Sergeant First Class Lawrence Joel (22 February 1928 - 4 February 1984) was a U.S. Army soldier who served in the Korean and Vietnam Wars. While serving in Vietnam, he was a medic with the rank of Specialist Five and assigned to 1st Battalion of the 503rd Infantry Regiment in the 173rd Airborne Brigade. 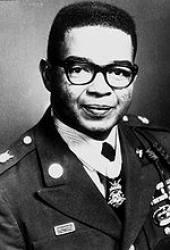 Joel received the Silver Star and the Medal of Honor for his heroism in a battle with the Viet Cong on 8 November 1965. He was the first living black American to receive this medal since the Spanish-American War in 1898. Born on 22 February 1928 in Winston-Salem, NC, Joel attended city public schools, including Atkins High School, and joined the Merchant Marines for one year. In 1946, at age 18, Joel decided to join the U.S. Army, making a career out of it. He enlisted in New York City. On 8 November 1965, then-Specialist Five Lawrence Joel and his battalion of paratroopers were sent on a patrol for Viet Cong soldiers near Bien Hoa, warzone "D" in the heart of Vietnam, conducting Operation Hump. Joel and his battalion shortly found themselves in a Viet Cong ambush, outnumbered six to one. Under heavy gunfire, Joel did his duty as a medic, administering first aid to wounded soldiers. Joel defied orders to stay to the ground and risked his life to help the many wounded soldiers; nearly every soldier in the lead squad was either wounded or killed in the battle. Even after being shot twice (once in the right thigh and once in the right calf), Joel continued to do his job; he bandaged his wounds and continued to help the wounded in not only his unit, but in the nearby company as well. When his medical supplies were depleted, he hobbled around the battlefield for more, using a makeshift crutch. Joel attended to thirteen troops and saved the life of one soldier who suffered from a severe chest wound by improvising and placing a plastic bag over the soldier's chest in order to seal the wound until the supplies were refreshed. After the firefight, which lasted over twenty four hours, Joel was hospitalized and shipped to locations including Saigon, Vietnam and Tokyo, Japan to recover. Shortly after, he received the Silver Star for his activities on 8 November 1965. Citation: For conspicuous gallantry and intrepidity at the risk of life above and beyond the call of duty. 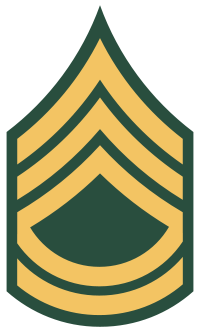 Sp6 Joel demonstrated indomitable courage, determination, and professional skill when a numerically superior and well-concealed Viet Cong element launched a vicious attack which wounded or killed nearly every man in the lead squad of the company. After treating the men wounded by the initial burst of gunfire, he bravely moved forward to assist others who were wounded while proceeding to their objective. While moving from man to man, he was struck in the right leg by machine gun fire. Although painfully wounded his desire to aid his fellow soldiers transcended all personal feeling. He bandaged his own wound and self-administered morphine to deaden the pain enabling him to continue his dangerous undertaking. Through this period of time, he constantly shouted words of encouragement to all around him. Then, completely ignoring the warnings of others, and his pain, he continued his search for wounded, exposing himself to hostile fire; and, as bullets dug up the dirt around him, he held plasma bottles high while kneeling completely engrossed in his life saving mission. Then, after being struck a second time and with a bullet lodged in his thigh, he dragged himself over the battlefield and succeeded in treating 13 more men before his medical supplies ran out. Displaying resourcefulness, he saved the life of one man by placing a plastic bag over a severe chest wound to congeal the blood. As 1 of the platoons pursued the Viet Cong, an insurgent force in concealed positions opened fire on the platoon and wounded many more soldiers. With a new stock of medical supplies, Sp6 Joel again shouted words of encouragement as he crawled through an intense hail of gunfire to the wounded men. After the 24 hour battle subsided and the Viet Cong dead numbered 410, snipers continued to harass the company. Throughout the long battle, Sp6 Joel never lost sight of his mission as a medical aidman and continued to comfort and treat the wounded until his own evacuation was ordered. His meticulous attention to duty saved a large number of lives and his unselfish, daring example under most adverse conditions was an inspiration to all. Sp6 Joel's profound concern for his fellow soldiers, at the risk of his life above and beyond the call of duty are in the highest traditions of the U.S. Army and reflect great credit upon himself and the Armed Forces of his country. 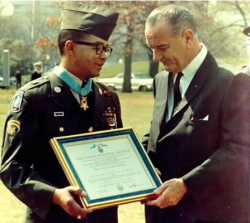 On 9 March 1967 on the White House lawn, President Lyndon Johnson presented Joel with the Medal of Honor for his service in the Vietnam War. On 8 April 1967, the city of Winston-Salem held a parade to honor Lawrence Joel. He grew up on the east side of the city, a predominantly African-American section of the city at the time. The New York Times called it the biggest tribute the city had ever staged. Lawrence Joel retired from military service in 1973. Several different buildings and memorials have been named in his honor. The first military memorial named in his honor was Joel Drive, which encircles Blanchfield Community Hospital at Fort Campbell, KY, dedicated in 1985. In memory of Lawrence Joel and all Forsyth County veterans, the Winston-Salem Board of Aldermen (now City Council) in February 1986 decided to name the city's new coliseum the Lawrence Joel Veterans Memorial Coliseum. Construction for the coliseum began one year later and opened in 1989. In 2007, a study funded by the Winston Salem City Council opened the possibility of selling the coliseum's naming rights to some corporation. &Lawrence Joel is mentioned in the song "8th of November" by country group Big & Rich. Kris Kristofferson gives a prelude speech to the song in which he recognizes Joel and his heroic feats on the 8th of November, 1965 in Vietnam. The Joel Auditorium at Walter Reed Army Medical Center in Washington, DC is named after Lawrence Joel. The U.S. Army clinics at FT McPherson, GA and FT Bragg, NC, are named after Joel. On 4 February 1984, Lawrence Joel died of complications from diabetes. He is buried at Arlington National Cemetery in Arlington, VA, in Section 46, Lot 15-1, adjacent to the Memorial Amphitheater.